(Nanowerk News) Magnetic fields play an important role in the physics of the interstellar medium, but they are very difficult to observe at vast distances corresponding to large look-back times in the cosmic history. An international team of astronomers led by Sui Ann Mao (MPIfR, Bonn, Germany) was able to measure the magnetic field in a galaxy beyond the local volume, as seen 4.6 billion light years away at a redshift of 0.439. The galaxy, acting as the gravitational lens in the system CLASS B1152+199, is the most distant galaxy to-date in which a large-scale coherent magnetic field has been observed. This measurement provides new insights into the origin and evolution of magnetic fields in the Universe. Using observations of a gigantic cosmic lens carried out with the Karl G. Jansky Very Large Array, a team of astronomers has detected coherent magnetic fields in a galaxy as seen almost five billion light years away (Nature Astronomy, "Detection of microgauss coherent magnetic fields in a galaxy five billion years ago"). These measurements provide new clues about a problem at the frontiers of cosmology: the nature and origin of the magnetic fields that play an important role in the evolution of galaxies. When a background quasar and a foreground distant galaxy are closely aligned along the line of sight as in the system CLASS B1152+199, light from the quasar is gravitationally lensed by the foreground galaxy, forming two separate images as seen from Earth. One can use the light from the quasar passing through different parts of the lensing galaxy to study magnetic fields in a galaxy we otherwise cannot see. The team measured a property of the radio waves called polarization that changes when passing through the magnetic field of the foreground galaxy. The astronomers measured this change, the so-called Faraday rotation effect, of the two lensed quasar images to show that the distant lensing galaxy hosts a coherent large-scale magnetic field. The detection of a strong coherent magnetic field in a galaxy when the universe was about two-thirds of its current age allows the team to measure how fast these fields grow in galaxies. “Although this distant galaxy had less time to build up its magnetic field compared to local galaxies, it still managed to do so”, says Sui Ann Mao, leader of a Minerva research group at the Max Planck Institute for Radio Astronomy in Bonn, the lead author of the study. “The results of our study support the idea that galaxy magnetic fields are generated by a dynamo process.” she adds. Despite great progress in cosmology, how the Universe became magnetized remains an unsolved problem. It is generally recognized that the original magnetic fields in no way resemble the fields we see today in galaxies, but have been amplified and reconfigured by dynamo processes tied to circulation and turbulence within the interstellar gas. Describing the dynamo, particularly how it imparts large-scale structures to the magnetic field, is itself a largely unsolved problem. 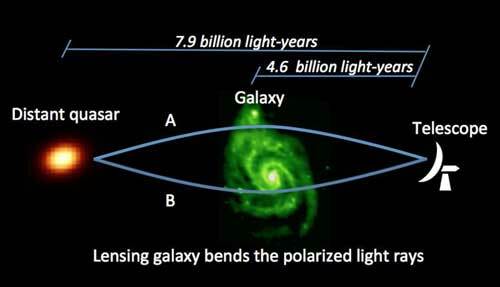 “Our measurements have provided the most stringent test to-date of how dynamos operate in galaxies”, says Ellen Zweibel from the University of Wisconsin Madison, USA. "This finding is exciting - it is the first time we can reliably derive both the magnetic field strength and its configuration in a distant galaxy,” says Sui Ann Mao. The strong lensing system CLASS B1152+199 is now the record holder of the highest redshift galaxy for which this magnetic field information is available. “Our work demonstrates the power of strong gravitational lensing and broadband radio polarimetric observations in revealing magnetic fields in the high redshift universe,” she concludes.